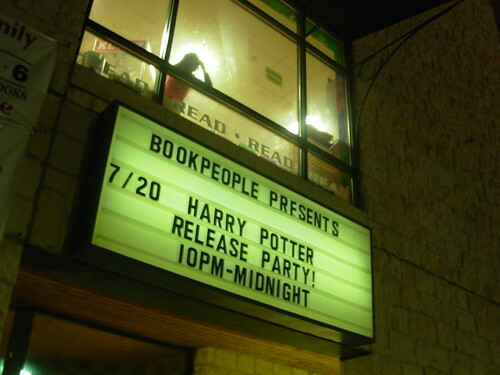 i had already ordered my copy of the last harry potter from amazon when i found out that a few of my friends would be going to two bookstores on release night. though i didn’t need to buy a book, i decided to go with them anyway. this is good, i thought. this way i could watch everything from afar without waiting in any crazy wristband lines, secure in the knowledge that my book will arrive on my doorstep the next day. i didn’t feel the first pangs of jealousy until the ride home from the second bookstore, when my friend sharlee handed me her brand-new copy of harry potter and the deathly hallows and said, “here, alison. want to look at it?” so i took it from her and looked at it. my first instinct was to open the car door and roll out into the street, clutching the book to my chest. it’d be a long and painful walk home, but at least i’d have something to read on the way. but since it was too dark to read, and reading while walking is usually a good way to faceplant, i decided to stay in the car. plus sharlee would probably never talk to me again. so i resigned myself to having to spend most of today waiting for my book. i was fine until about one p.m. — i cleaned my apartment and did some organizing and stayed off the internet. but now it’s four-thirty, and i’m not really fine so much as OH MY GOD MY BOOK ISN’T HERE YET WHERE IS IT. i’m stuck here in my apartment watching barry “total douche” bonds try to hit home runs with a bat that looks like a twig in his massive, meaty hands, staring out the window every time i hear a car engine, and refreshing the UPS tracking page over and over again to see if anything’s changed. i’d say that i’ve learned my lesson, and next time i’ll be sure to get a copy locally even if it means standing in line. but this is the last book in the series, so there will be no next time. maybe i should just stop being a fan of things. i’m clearly not very good at it. i waited all day for my copy to show up via UPS. when six-thirty rolled around and it hadn’t arrived, i was on IM complaining to a friend. he told me that sometimes UPS contracts their deliveries out to the post office, and that perhaps my copy had come in the mail. but of course the office was closed for the day, and is closed until monday, with my copy of harry potter inside. i immediately went to barnes and noble and bought one there so i don’t have to wait until monday. i’m pretty sure the cashier could feel my shame. what this means is that, counting the british copy i ordered and couldn’t cancel in time, i’ve purchased no fewer than THREE copies of harry potter. sure, i’m going to return the amazon one and give the b&n one to my sister, but i still think this whole fiasco makes it official that i’m the lamest person on earth. but i’m the lamest person on earth who also has a copy of the book, so i guess that’s something. please don’t ever tell anyone what i did. it’s TOO EMBARRASSING FOR WORDS. i am now happily on page 329. This entry was posted in bluishorange by alison. Bookmark the permalink.